Lowdown: A lunar employee encounters issues just before the time to return to earth has come. It seems like this year has been a vintage year from science fiction. It’s not only Avatar that I’m talking about (albeit while severely lacking in the science department); we’ve had proper science fiction in the form of District 9, and now I can proudly say that Moon joins the club. In perfect timing, if I may add, given I just finished reading a serious science fiction book taking place [mostly] on the moon (Robert Heinlein’s The Moon Is a Harsh Mistress). Moon takes place on the moon (dah) at a time in which energy and global warming are no longer issues for earth because abundant energy is harvested on the dark side of the moon (through some dubiously explained process) and sent back to earth. Ensuring this process takes place is a sole human employee, stuck on the moon for a three year contract and portrayed by Sam Rockwell. Conveniently enough, the character is called Sam. Sam’s only company are a HAL like computer (voiced by Kevin Spacey) and videos he receives from his wife; he cannot talk to her directly, because the satellite in charge of communications from the dark side is down, so Sam has to settle with video clips. As I already said, Moon is a serious science fiction film. Serious, in the sense that it creates an extreme version of our real world with which we can create analogies. Indeed, Moon’s analogies concern ethics at the personal and at the society wide level; given Moon starting off with the “history” of humanity’s treatment of the global warming problem, the analogy is fairly obvious. That said, I have to recognize there are some weaknesses to the science bit of Moon. For a start, the Moon’s gravity seems to be earth like in power; no doubt this is a budget issue, but it’s actually critical to the film's logic because after three years on the moon a human cannot expect to be able to survive earth’s gravity. There are other potential issues but I’m already being picky: fact is, Moon doesn’t rely on its problematic science to deliver its core story (again, potential spoilers prevent me from a thorough discussion here; you’ll have to take my word for it until you get to watch the film). So I’ll repeat myself: I consider Moon serious sci-fi because it makes you think, unlike the sci-fi presented in Avatar where you’re spoon fed while your brain is shut (or rather, mesmerized by the beauty of the visuals). Moon borrows heavily from previous great serious sci-fi flicks, such as Blade Runner, Silent Running, 2001: A Space Odyssey, and Outland. It borrows, but it does not copy or imitates; the outcome has its own originality. 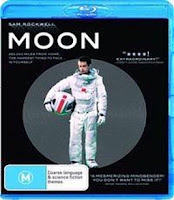 In Australia, Moon's Blu-ray is rated M for, amongst others, "science fiction themes". Now I fully acknowledge Moon is not a kids' film, but since when are science fiction themes reason enough to make a film inadequate for younger audiences? Or rather, should Star Wars be banned for its "science fiction themes"? I would say this goes to show the pathetic processes at hand with the rating systems; trouble is, they want to enforce these over our internet, too. Best scene: Rockwell’s acting is so good you tend to forget he’s playing both versions on himself on the screen at the same time. It’s the first time I have noticed such a seamless dual performance; it always tends to look artificial to one extent or another, but not in Moon. For example, I only thought of the ingenuity involved with Rockwell playing table tennis with himself while the scene was discussed in the Blu-ray’s supplementals. Technical assessment: The picture on this Blu-ray is rather too grainy and shy of details, probably testimony for Moon’s meagre budget of 5 million dollars; that’s probably Avatar’s budget for shoelaces. The sound, while not the most detailed ever yet aided with a wonderful score, does a very effective job at conveying the claustrophobic stress Sam is in. Overall: A mighty achievement that’s actually quite incredible given its budget. I rate it at 4.5 out of 5; highly recommended!